An Eco-Friendly, premium green adhesive for Indoor & Outdoor synthetic putting green / turf & carpet seaming. XGS SEAM GLUE adhesive is aromatic type polyurethane. Perfect to use indoors or outdoors. Excellent for basements or indoors around swimming pools, jacuzzis and spas. Use for the installation of exterior grade indoor/outdoor carpets that are rubber backed, needle punched, urethane backed, latex unitary, marineback, artificial turf and polypropylene secondary backed carpets. Product is made to order so it is always fresh when you receive it! Any purchases over 275 gallons or more will have FREE SHIPPING! Condition the area to be installed. Make sure adhesive and surfaces are at 45°F (7°C) or above for 48 hours before, during and 48 hours after installation. Surfaces must be sound, smooth, dry, clean and free of excessive moisture or alkali. Remove dirt, wax, loose paint and all other foreign matter that would interfere with a good bond such as curing agents and sealers. 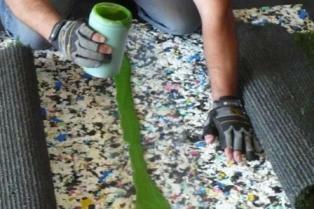 If using seam tape/binder material, make sure it is free of debris before applying the adhesive. After application to the substrate or binder fabric, wait about 15 – 25 minutes for adhesive to absorb surface and atmospheric moisture, and then lay down turf. Longer wait time required under drier conditions. Once small bubbles start to develop on the surface of the adhesive, press the artificial grass firmly, applying enough pressure to ensure full contact between both. (you won’t need anything to weigh it down, weighing it down can cause our glue to push out against the turf). Wait 5 minutes - do not lift the turf as lifting will not allow any adhesive to adhere. After 10-15 additional minutes, press seams ensuring contact between both surfaces (a weighted roller may be used for field applications). You can begin brooming and infilling if required after 2-3 hours when the adhesive will harden to the touch. Adhesive will be completely cured in 24 hours. Since XGS SEAM GLUE is a moisture-curing adhesive, the humidity in the air, substrate and artificial grass backing will ultimately affect the outcome of the bonding. Extreme temperature variations will also affect the curing process. From Anonymous of Long Island , New York on 5/22/2014 . 2/16/2012 – will this adhesive work on turf white lines? (boundary sport lines for soccer fields) we shave the turf to its base and we . . .